Oil production globally has been growing over the last 50 years, apart from a drop in the early 70s and again in the early 80s after oil prices spiked upwards causing recessions. 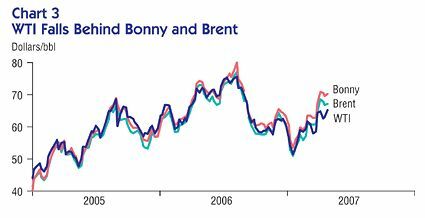 This indicates the historical sensitivity of oil consumption to oil price. OPEC production is seen as the swing producer - these producers capture spare demand and decrease production if oversupply drives prices down. The end 2008 recession is also leading to reduced supply from OPEC as they cut production to support prices that dropped to $34/bbl mid December 2008. Most region's oil production has increased over the years, particularly Europe (North Sea and Russia) and Asia Pacific. North Amercia production has been more constant. Middle East (mainly OPEC production) has fluctuated - acting as a "swing prducer" - generally increasing during periods of high oil price and decreasing during period of low oil price. Oil Production North America - from 1965 and forecast to 2015 - as a continent, oil has actually increased from 10 million bbls/day in 1965 to 14 million bbls/day today - and is forecast to remain on a plateau until 2015 - mainly from increases in canada offsetting decreases in Mexico and USA.